Make for a Great concept theme for haunted house scene. Head, hands, feet, and blood spattered sheet. Very cool fits on a bed, floor, ground or table top. For best results, place pillows (NOT included) or stuffing under bloody bedding for a more realistic effect. Can also be used in fake graves, coming out of the ground in cemetery scenes, mad scientist labs or anything you can imagine! This scary rotting flesh ghoulish Zombie has been infected by the zombie virus, now all he wants to do is eat your brains!!! A great decoration for your yard or Halloween party. 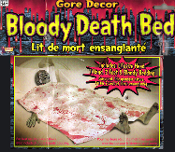 REALISTIC HAUNTED, SCARY, SPOOKY and GROSS... Fresh Decor from a Creepy Haunted House!